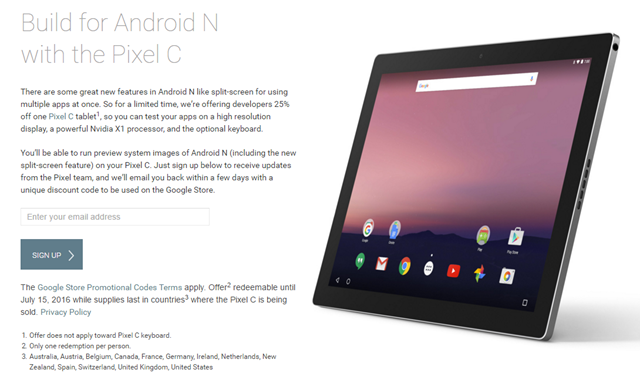 Remember that sweet 25% discount on the Pixel C tablet for "developers?" (Don't worry, you don't actually have to be a developer.) Originally it was only available to buyers in the United States, United Kingdom, Ireland, Australia, and New Zealand, but as of today it's been updated to apply to a handful of new counties. Customers in Austria, Belgium, Canada, France, Germany, The Netherlands, Spain, and Switzerland can now take 25% off of the local currency price. Remember that the discount requires a code, which may take anywhere from a few hours to a day or two to hit your inbox once you request it. Once you do, you can take that sweet quarter chunk out of the considerable price of the premium tablet, in either the 32GB or 64GB flavors. Unfortunately that doesn't apply to the Pixel C's neat induction-charging keyboard, but the discount should let you buy it more or less for free if you really want to. The discounted price is good until July 15th or "while supplies last," which depending on your local country and Google's stock, may be sooner than you think. Get an order in soon if you want one, and only one, since they're limited to one discount code per order.